What went wrong with Sri film? Sri is an action film right from the frame one till the climax. And I admit my performance was bad as I did not believe in the story and could not connect with the character and it reflected in the film. However I got good name in fights departments. I knew the result of the film halfway through the production. We (me and Sunil) used to tease director Dasarath that it is going to be a flop. I loved the character of Donga Dongadi (debut film). Likewise I loved the character of Rajubhai as well. There is a realistic touch in Rajubhai character. The story of the film is about how a tapori joins the gang of goons. It is a family entertainer with realistic touch. What are the highlights of Rajubhai? Songs and fights. The fights in this film are done without any wirework and computer graphics. There is a twist in the film. If that works out, the film will do well at the box office. Tell us about the music of Rajubhai? I know Yuan Shankar Raja since my childhood and he is like a brother. Working for this film first topped his agenda over 8 simultaneous projects he is right now working on. All the tunes in this film are fresh. We took only one song from original and this song sports Sunil. Tell us about director Surya Kiran? 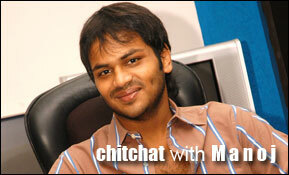 He is the one who came up with the idea of remaking Chitram Pesuthadi. That film was already being dubbed in Telugu when Surya Kiran narrated me the subject. We bought the rights and remade the film as Raju Bhai. The major advantage of working with Surya Kiran is that he is a terrific actor. He acts and then asks us to do that. Did you make any changes in original? The original is a complete serious film. We added comedy touch in the first half and seriousness in the second half for the Telugu version. You inherited the great voice of Mohan Babu. How do you feel about it? It is a blessing. I can speak just like my father. But my age does not suit that voice. I will try to develop my own modulation and dialogue delivery. May be as I grow up and become big, I use his voice modulation while doing serious character. Are you open for multistarrers? Yes. I am open for mulristarrers. Generally our heroes work in multistarrers only if the heroes belong to same family. My father and brother worked for Game. We all know the result. The chemistry did not workout between them as the real relationship of father-son dominated the screen relationship of protagonists. But egos come first in Telugu film industry? I am open. If anybody gives an advertisement for actors, I would be the first person to stand in the line and give an audition. I don't mind even if I get rejected. But I am willing to try. I don't mind doing the roles of hero, villain or comedian. I am keen to break the barriers of ego and star feeling to act in interesting films. I have seen many actors with terrific talent not getting film chances. I want to put myself in their position and compete with them. Do you do any homework to play a character? I think doing homework is very important while playing character. We don't have training or rehearsals while preparing for the films. I had the fortune of seeing the shooting of 'Planet of Apes' in USA. I observed Matt Damon doing rehearsals by observing apes. Hollywood makes greatest films ever and at the same time they do so much of homework unlike in Telugu films where we go to sets and work there without any preparation. Rajendra Prasad is my favorite actor. I used to put banners in Tirupati theaters during his film releases. I feel that every actor should be like Rajendra Prasad who is very talented and versatile. I also like Kantha Rao. My favorite actress keep on changing from time to time. Now it is Rani Mukherjee. I want to do a film like Tom Hanks' Castaway. What is your opinion on Telugu cinema vajrostavalu controversy? You have flexible body. How do you manage? I run 6-7 kms a day. I got a flexible body and I survive on non-oil food when I want to slim down. My next film might require me to be extra thin. I will have to change my looks and shed lots of weight for that character. Why are you so fascinated with Jackie Chan? I am a huge fan and I always wanted to meet him. I tried in LA and Hong Kong, but I missed him. I finally got a chance when he was in Hampi, India to shoot for Myth. It was my most memorable moment. After working with you choreographer Ganesh Acharya opined that you have body movements of Hrithik Roshan and expressions of Govinda? Chala ekkuvaidani anipinchindi. I should not listen to such compliments. It might get confirmed in a couple of weeks. I might be doing an experimental film in which I play a 'lean guy' (bakkodu) character.